Have You Ever Wonder…? | What Is? How you can use the social media to promote and expand the ministries of your church or Christian organization? 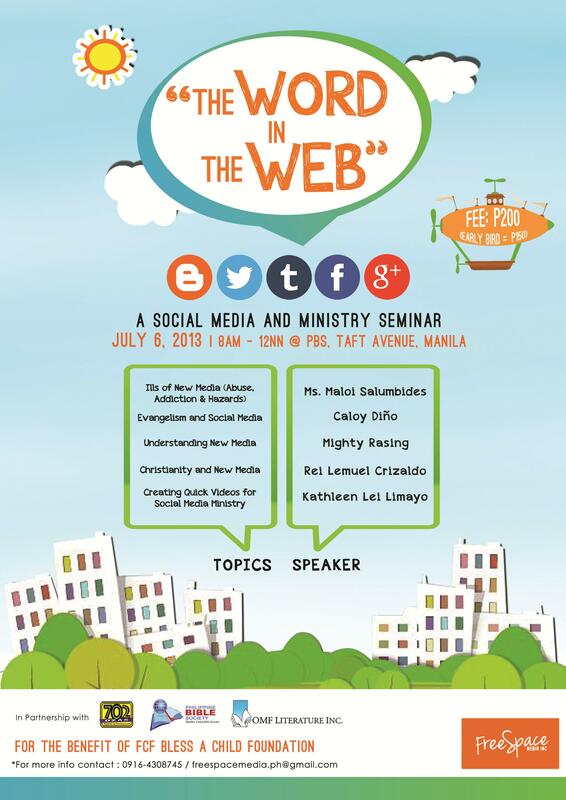 Attend “The Word in the Web”: Social Media and Ministry Seminar, on July 6, 2013 Saturday, from 8am to 12 noon at the Philippine Bible Society Building, UN Avenue, Manila. Seminar fee is P200. Register now for the Early Bird promo with a discounted fee of P150 plus a free book from OMF Literature for the first 30 registrants. Register online here. For more information, contact 0916-4308745 / 0923-1448432 or email freespacemedia.ph@gmail.com. This entry was posted in Journal and tagged Christianity, Evangelism, Ministry, Plug, Promotion, Religion and Spirituality, Social Media, Social Media Ministry. Bookmark the permalink.